The first national park of Nepal, Chitwan national park was established in 1973. As the name suggests (chit- heart and wan/ban- jungle), Chitwan national park is ‘HEART OF THE JUNGLE’. It was listed as UNESCO World heritage site in 1984. 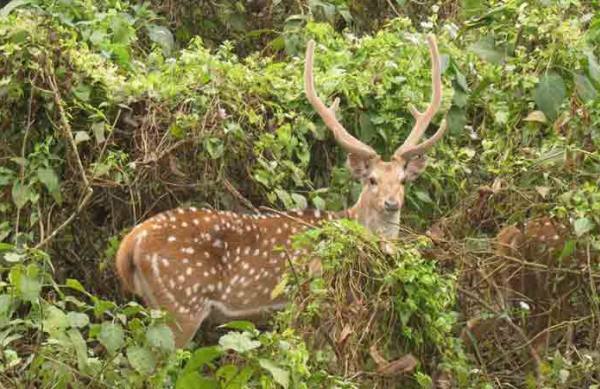 The national park covers the total area of 932 square kilometers and extends over four districts namely Chitwan, Nawalparasi, Parsa and Makwanpur district. Chitwan National Park is located at mid south terai and altitude rises from 100m to 800 m towards the east. Narayani-Rapti river system forms natural boundary towards North-West, Parsa wildlife reserve in the east and Valmiki national park (India) on south. Buffer zone of 766 sq. km. surrounds the national park. The buffer zone contains Beeshazar which was characterized as wetland under Ramsar site. Chitwan National Park consists of tropical and subtropical vegetation with Terai-Duar savanna and grassland (covering 20% of total area) and Sal (Shorea robusta) forest (covering 70% of total area). The National park consists of a diversity of ecosystem like Churia hills, Ox-bow lakes, wetland and flood plains of the Narayani, Rapti and Reu River. More than 50 species grassland species like Elephant grass, Giant cane, Khagra reed, Kans grass etc. Riverine forest and grassland are found along the river banks. In low land areas Catechu, Rosewood, Kapok, Rhinoapple trees (food for rhinoceros) etc are found. Sal tree dominantly covers the forest. On southern slopes Rosewood, Beleric, Elephant apple and creepers are found among the sal trees. Chitwan National Park is home for more than 750 wildlife species including 544 bird species, 68 mammal species, 55 species of reptile and 126 fish species. The National Park which had a history of being a favorite hunting ground for Nepal’s ruling class is now renowned for its protection of different wildlife species. The recent census figure shows the steady increase of protected species like Rhinoceros (645) and Bengal tiger (120). Alluvial floodplain habitat in Chitwan is one of the best habitats for Bengal tigers in the world. The protection of Gharial crocodile has been challenging since the number declined i.e. 235 in 1959s to just 38 in 2003. Other fascinating wildlife species like Leopard, Elephants, Sloth bears, monkeys (Rhesus, Hanuman languars etc), Golden jackals, four-horned Antelopes and more than 550 species of birds. More than 160 species of birds migrate annually from northern and southern parts. 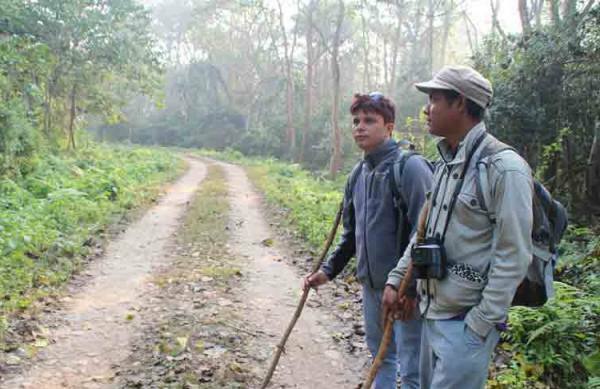 Different species of birds like Bengal florican, Grey-crowned prinia, Bulbuls, Mynah, Peacocks, Spotted eagle, Kingfisher, Goosander, Paradise flycatcher (with long majestic tail), Babblers and many globally threatened species of birds are found in Chitwan National Park. This National park is one of the most popular and most visited National Park in Nepal. More than 200,000 people visit this National park annually. Apart from viewing natural beauties and wildlife people also enjoy various jungle activities like Jungle walks/trekking, Jeep safari (full day/ half day), Elephant back safari, visit Elephant Breeding Center (baby elephants), Bath with elephant, Canoeing, Sunbath and Sunset view from river bank. Jungle walk:- Jungle walk is one of the adventurous and entertaining activities at Chitwan National Park. 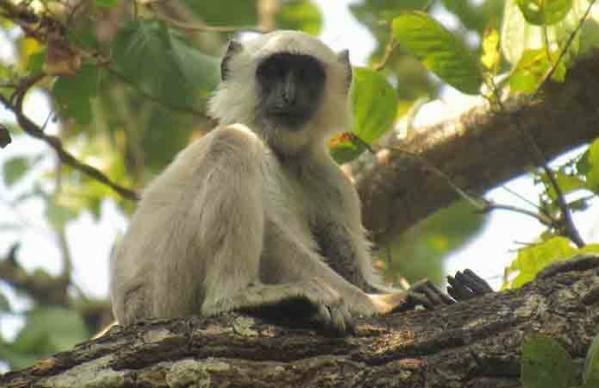 Tourists can walk through the dense Sal dominant forest and see the wildlife and birds in their own natural habitat. Jeep safari activity:- One can also use jeep for safari along the jungle in Chitwan National Park. Tourists can enjoy looking the jungle and wildlife sitting on the back of open jeep. Tourists can visit Gharial breeding center during jeep safari. It is also a popular jungle activity at Chitwan National Park. Elephant back safari activity:- Elephant back safari in Chitwan is safest and most suitable way to visit wildlife up close in natural wildlife habitat. One can ride an elephant and enjoy the view of jungle, birds and wildlife in it. Elephant breeding center:- Established on 1985, elephant breeding center is popular for viewing newly born small elephants. Elephant Breeding Center was initially established for the protection of endangered elephants but now they are one of the most visited locations inside Chitwan national park. Elephant breeding center in Chitwan is one of the only two breeding centers in the world. Bath with elephant:- Tourists can now bath with Elephant in Chitwan National Park. Tourists can play, bath and dive into the river from the back of elephant. Elephant shower through the trunk of elephants is loved by many tourists. Canoeing:- Dugout canoe ride in Chitwan national park offers you the chance to see different rare bird, animal and crocodile species. Tourists can have the sight of Marsh Mugger crocodile (man-eater crocodile) and Gharial crocodile (rare species). Lovely Nepal Tours and travel is Kathmandu based inbound and outbound tour operator which selling the various tour packages at Chitwan National Park. We are specialized to arrange the various activities in Chitwan National Park that address your requirements, budget and time schedule. Please feel free to visit our tailored made holiday packages to Chitwan National Park such as Popular Activities at Chitwan National Park (2 Nights 3 Days), Two days jungle walk, 3 Days Jungle Walk, Bird watching etc. Also feel free to contact us if the above mentioned itinerary doesn’t meet your requirements. We do operate the customized holiday packages as well. Just let us know to explore in your own way.